Lyon clinched the final Champions League last-16 place as Nabil Fekir's second-half strike grabbed a 1-1 draw against Shakhtar Donetsk in a snowy Kiev on Wednesday, while Bayern Munich pipped Ajax to top spot in Group E.
Bruno Genesio's Lyon needed to avoid defeat against Shakhtar to progress from Group F with Manchester City, and a fifth successive draw in the competition achieved that aim. "It was hard in difficult conditions. We gave ourselves a fright and it's a pity we didn't kill off the game in the first half," Lyon midfielder Houssem Aouar told RMC Sport. "The main thing is that we've qualified." Shakhtar forged ahead midway through the opening period with what proved their only shot of the first half, just seconds after Lyon forward Bertrand Traore had been denied by Andriy Pyatov when clean through one-on-one with the goalkeeper. Lyon continued to dominate, though, and finally equalised in the 65th minute as Nabil Fekir hammered a left-footed strike into the top corner following excellent play by Memphis Depay. Man City wrapped up top spot in the group by coming from behind to beat Hoffenheim 2-1 at the Etihad Stadium. Andrej Kramaric gave Hoffenheim a surprise 16th-minute lead from the penalty spot, although Leroy Sane levelled on the stroke of half-time with a magnificent free-kick. Bayern Munich went into their game at Ajax just needing a point to beat their opponents to first place in Group E, and Niko Kovac's men did just that in a thrilling 3-3 draw. The game burst into life in the second half when Dusan Tadic equalised Robert Lewandowski's early opener just after the hour mark, with Ajax defender Maximilian Woeber sent off in the 67th minute for a dangerous lunge on Leon Goretzka. But Bayern were also reduced to 10 men only eight minutes later, as Thomas Mueller was given his marching orders for planting his studs into the head of Nicolas Tagliafico. But Tagliafico brought down Thiago Alcantara, with Lewandowski slotting in the spot-kick, before Kingsley Coman looked to have settled matters with a wonderful 90th-minute strike. 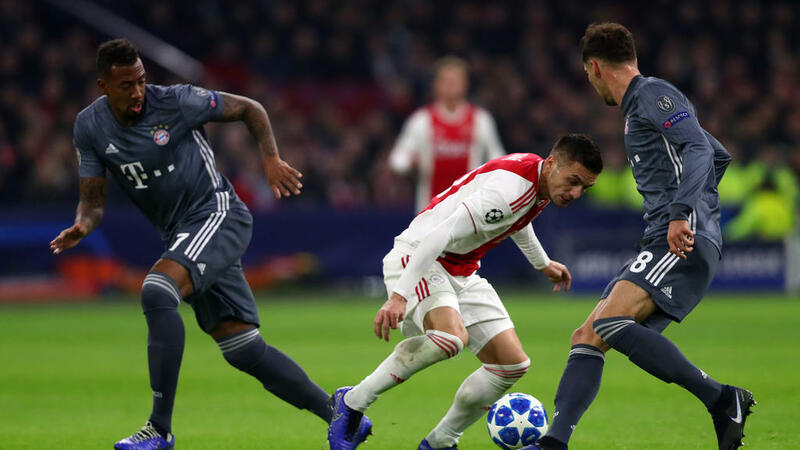 Tagliafico went up the other end to equalise again, but Ajax failed to find a winner as Bayern just about held on. "That was an advert for football," smiled Kovac. "The most important thing was to finish top of the group and with 14 from 18 points we are happy." Juventus finished at the Group H summit ahead of Manchester United despite slumping to a 2-1 defeat by Young Boys in Bern, as Jose Mourinho's Premier League giants lost at Valencia. United had to beat Valencia and hope Juve failed to win in Switzerland, but Carlos Soler and a comical Phil Jones own goal did the damage for the visitors, with Marcus Rashford scoring a late consolation. "I didn't learn anything at all," Mourinho said. "Nothing surprised me at all." Guillaume Hoarau netted twice to help Young Boys end their European campaign on a high note. CSKA Moscow stunned a much-changed Real Madrid with a 3-0 victory at the Santiago Bernabeu, but still finished bottom of Group G as Viktoria Plzen beat Roma. The Russian side, who also downed Real 1-0 in the reverse fixture, had to better Plzen's result to finish third and qualify for the Europa League. But Plzen edged out Roma 2-1 in the Czech Republic to render CSKA's famous victory ultimately meaningless, despite inflicting the heaviest ever European home loss on the record 13-time champions. "It's sad to say the least to beat Real Madrid, earn seven points, but finish bottom and get eliminated from Europe," said CSKA coach Viktor Goncharenko. Holders Real had already progressed to the last 16 as group winners, with Roma through in second place. Home coach Santiago Solari boosted CSKA's hopes before kick-off by making seven changes to his starting XI, and goals from Fedor Chalov, Georgiy Schennikov and Arnor Sigurdsson gave CSKA a comprehensive win.